Russia's state aviation authority has banned Egypt's national carrier from flying to Russia, a Moscow airport spokesman says. 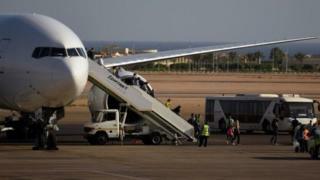 Flights from Russia to Egypt are already suspended after a passenger plane crashed in the Sinai last month. All 224 people on board were killed, mostly Russian nationals. Egypt Air had been the only airline flying between the two countries and the move was to ensure it met safety requirements, Russian media reported. Sinai Province, a group affiliated to Islamic State, has repeatedly claimed it brought down Metrojet Flight 9268, flying from the Egyptian Red Sea resort of Sharm el-Sheikh to the Russian city of St Petersburg. Western officials say there is a strong possibility that a bomb exploded on the plane, but Russia and Egypt say it is too early to draw conclusions. Following the crash, several countries, including the UK, halted flights to and from the resort due to intelligence concerns - stranding thousands of holidaymakers. Russia's action, effective from Saturday, is a further blow to Egypt's tourism industry. Russians make up close to one in three of all foreign tourists in Egypt. In 2014, about three million Russian nationals stayed at Egypt's resorts.